The Mangledwurzels are a three-piece Scrumpy & Western band based in Somerset celebrating the works of the Bard Of Avonmouth, Adge Cutler and The Wurzels. More than just a Wurzels tribute band, The Mangledwurzels play Wurzels songs, old and new, blended with self-penned titles and pop standards 'Mangled' in true Wurzels tradition. The Mangledwurzels are Hedge Cutter on lead vocals, Seth Pitt on guitar, kick drum and vocals, and Jethro Too! on bass, keyboards and vocals. Together they provide a performance intimate enough for the smallest of pubs and clubs, or big enough for a large outdoor festival or show. A quick look at the band's packed gig guide will show how popular the trio are. Formed in early 2005, The Mangledwurzels are all experienced musicians who have graced a wide variety of stages and venues across the country. 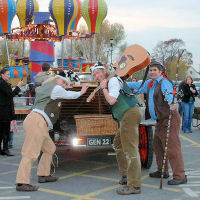 The Mangledwurzels effortlessly convey their innate sense of fun and humour to their audiences both through the song lyrics and their performance, and can be guaranteed to satisfy any size of audience regardless of age, gender or musical preferences. Based in the West Country, with the band born and bred in Somerset, The Mangledwurzels are in the ideal position to produce a genuine West Country Scrumpy & Western sound. You can book the The Mangledwurzels for gigs, parties, weddings, functions, corporate events, festivals, agricultural shows or farmers balls.